With consolidated debt of around Rs15,000 crore, Jet Airways’ QIP will be yet another means to deleverage its balance sheet. Of the total debt, around Rs10,500 crore is towards payment for aircraft. 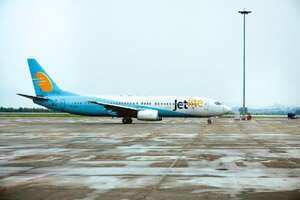 The balance may be utilized towards payment to creditors and the payment obligation towards JetLite (India) Ltd (formerly Air Sahara), its subsidiary low-cost airline. However, the company has consolidated cash on its books of around Rs840 crore, with the net debt to equity ratio at around 4. Analysts estimate that with the QIP proceeds, the debt to equity ratio should decline to around 2.5-2.7. Analysts had expected a turn around in the company’s fortunes for the quarter ended September. But the results disappointed—it posted a higher net loss of Rs407 crore compared with around Rs385 crore a year ago. While air traffic was just picking up in September, the five-day pilots’ strike resulted in a loss of nearly Rs100 crore. In a conference call with analysts after the second quarter results, the management said the loss from domestic operations was Rs366 crore whereas that from international operations, which now account for nearly 62% of the company’s revenue, was around Rs40 crore. Jet’s strategy to combat the downturn has been two-fold—to reduce capacity and to shift focus to the economy/low-cost arena. The upshot has been that the ratio of seats occupied to that of available seats increased 14% on a year-on-year basis to 72% in the domestic sector and by 18% to around 82% in the international sector. Jet’s settlement towards Air Sahara is still pending in court and according to analysts will have some impact on the cash flows, if any penalty is levied on the company. The stock has been rising steadily since April, more so in the last three months. This comes as an advantage as the QIP average price has more than doubled since the company filed for approval. It could imply a lower level of dilution in the promoter holding, as the number of fresh shares to be issued will now be lower. According to a 21 December report by Merrill Lynch, “Jet has seen +20% improvement in domestic yields in the ongoing quarter over the trough of the previous quarter. We expect yields to remain firm on the back of curtailed supply." 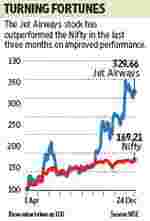 With the December quarter being the peak quarter for the airline business, Jet is likely to break even this quarter.